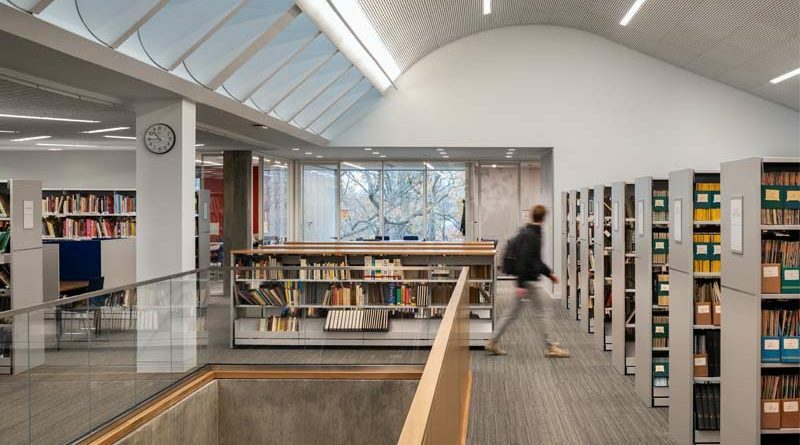 RIVERDALE, N.Y. — Architecture Research Office (ARO) of New York has completed a massive makeover of the Tate Library at the Ethical Culture Fieldston School (ECFS) in Riverdale. The facility has been completely updated to meet the needs of today’s students in accordance with the school’s mission of ethical learning, academic excellence and progressive education. ARO has instilled the Tate Library with a spacious and open layout, to provide better access to books, information and technology and to foster a variety of teaching and learning approaches. The new layout comprises offices, enclosed collaboration rooms, open group work areas and individual study places. The ceilings are highlighted by custom glass fiber-reinforced gypsum and new LED lighting, and the fresh study environment is designed with maximum sound absorption and thoughtful placement of furniture to showcase ample daylight and views of the campus. This comprehensive renovation of Tate Library at ECFS has morphed the iconic 1970 building into a learning commons that is a hub for the entire campus. In support of ECFS’s mission of ethical learning, academic excellence and progressive education, the building’s new open, roomy interior offers greater access to books, information and technology. Keeping the integrity of the original stone and concrete building, the exterior changes include new windows with “bird-friendly” glazing and a new main entrance facing the campus quadrangle. A reworked interior layout, technology infrastructure, environmental systems, and LED lighting optimizes the user experience and also considers evolving future needs. Custom glass fiber reinforced gypsum (GFRG) ceilings in the open areas integrate lighting and complement the continuity of the space. Careful zoning of activities and acoustical treatment, as well as new enclosed collaboration rooms, offices and support spaces around the perimeter of the building, boost group and individual studies. The main construction work on the 23,000-square-foot project took place from June 2017 to October 2018, and was overseen by Consigli.